As I have commented elsewhere, affirmative action isn't dead in California, it's just manifested differently since Proposition 209 passed. Any entity (like our very large public university systems) desiring federal dollars will comply with federal affirmative action requirements, but some will be more public about it than others. If you think she just swung by because she had Saturday morning free, I have a bridge to sell you. My take is, she wanted to come anyway, but I bet the March 4 Day of Action with its thousands of participants got some people's attention. Solis was the right person to send, as she is a graduate of the Cal State system, she's from a low-income background, and benefited from a Pell Grant, an Equal Opportunity Program, and more. And she wouldn't be where she is if certain doors had remained closed. I'll update this with some video I shot after I check it. I've been sort of tuned in to South by Southwest since David Byrne spoke there in 2007 giving both elegy AND eulogy for the medium known as the CD. This year, several people of my cyber-acquaintance have or had presences at SxSW 2010. I guess this is the famous line in the sand. Between this and the refusal of Texas to get on board with 48 other states supporting the Common Core framework for K-12 learning, I fear for my several Texas relatives who are in the public schools. The Civil War is never over, is it? AUSTIN, Tex. — After three days of turbulent meetings, the Texas Board of Education on Friday voted to approve a social studies curriculum that will put a conservative stamp on history and economics textbooks, stressing the superiority of American capitalism, questioning the Founding Fathers’ commitment to a purely secular government and presenting Republican political philosophies in a more positive light. More disgusting details from a March 10 New York Times story: "References to Ralph Nader and Ross Perot are proposed to be removed, while Stonewall Jackson, the Confederate general, is to be listed as a role model for effective leadership, and the ideas in Jefferson Davis’s inaugural address are to be laid side by side with Abraham Lincoln’s speeches." Trent Franks (R-AZ, which may mean he deserves razzing) may or may not be a distant relation of former congressman Gary Franks (R-CT) who seems to have disappeared after being proudly black and against affirmative action during the 1990s. We'll need Skip Gates to check that out in his next PBS special. What we know for sure about ol' Trent Franks (and what is it about people named Trent in Congress making racist remarks, anyway?) is this: He famously said a few months ago that President Obama is an "enemy of humanity." Oddly, that remark wasn't considered treasonous or worthy of FBI investigation (that we know of). 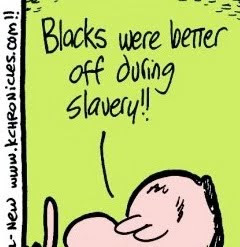 But he is newly famous for injudiciously suggesting that black people were victims of a greater scourge than slavery. That's been discussed at length elsewhere, and by some the remark is being dismissed as just a lame attempt at getting brownie points (ironically enough) from the pro-life crowd. I am concerned, though, that there is a never-ending nostalgia among, er, certain folks for the good old days when, uh, certain other folks knew their place, and they'll grasp at any straw (any straw...! You cannot be serious!) to keep the memory of those days alive. Every time you want to go all post-racial and do a national group hug, somebody serves up a gentle reminder as Franks did. Of all the commentary, I like Keith Knight's editorial cartoon best (so far). He's in my faves section in the left menu, but here's his Trent Franks rejoinder. Sample above, full cartoon at the link.